Earlier today, it was reported that iconic Star Wars actress Carrie Fisher passed away at the age of 60. Her death comes just four days after she suffered a heart attack on an international flight between London and Los Angeles, with the actress returning home from promoting her new book The Princess Diarist. As the news spread throughout the world, we have a number of tributes that have surfaced through social media, and from LucasFilm itself. Here's what LucasFilm president Kathleen Kennedy had to say in a statement. "Carrie holds such special place in the hearts of everyone at Lucasfilm it is difficult to think of a world without her. She was Princess Leia to the world but a very special friend to all of us. She had an indomitable spirit, incredible wit, and a loving heart. Carrie also defined the female hero of our age over a generation ago. 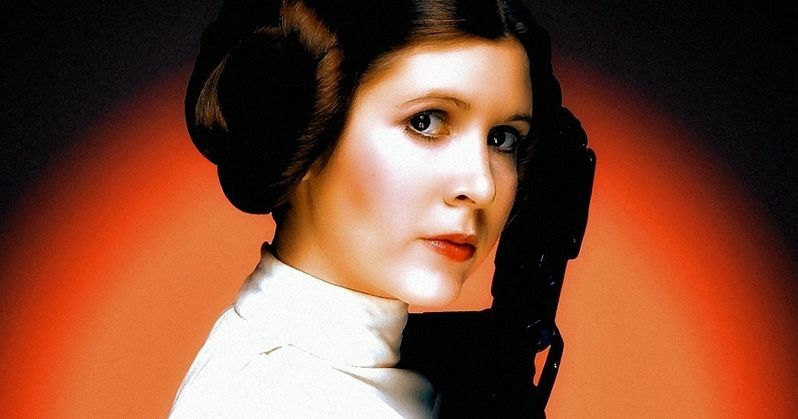 Her groundbreaking role as Princess Leia served as an inspiration of power and confidence for young girls everywhere. We will miss her dearly." Along with Kathleen Kennedy's statement, StarWars.com also released a statement from Bob Iger, Chairman and CEO, The Walt Disney Company, about the tragic passing of Carrie Fisher. Here's what he had to say below. "Carrie Fisher was one-of-a-kind, a true character who shared her talent and her truth with us all with her trademark wit and irreverence. Millions fell in love with her as the indomitable Princess Leia; she will always have a special place in the hearts of Star Wars fans as well as all of us who were lucky enough to know her personally. She will be sorely missed, and we join millions of fans and friends around the world who mourn her loss today." Among the many other fans who sent out tributes after word of her passing spread was filmmaker Kevin Smith, who cast Carrie Fisher as a nun who gives Jay (Jason Mewes) and Silent Bob (Kevin Smith) a lift in the 2001 comedy Jay and Silent Bob Strike Back. Like many longtime Star Wars fans, Carrie Fisher had quite the impact on the filmmaker's life. Here's what he had to say in his tribute on social media earlier today. "The Princess stole my heart at age 7. Anybody who knows me knows #CarrieFisher was my first love. I thrilled to the adventures of #princessleia in the @starwars movies, but from '77 to '84, I was in love with Carrie Fisher herself. My bedroom was filled with Carrie Fisher pictures from any movie she was ever in (including Polaroids I took off the TV when #thebluesbrothers hit cable). I was jealous of Paul Simon when he was dating Carrie Fisher and wouldn't listen to his music until they split up. I paid to see Carrie Fisher and #chevychase in Under the Rainbow nine times when it was in theaters (mostly because Carrie Fisher was in underwear in one scene). In childhood, I committed myself to Carrie Fisher without ever meeting her the way novice Nuns commit themselves to Christ without meeting Him. Decades later, I got to tell her this when Carrie Fisher and @jaymewes were in a station wagon on the set of #jayandsilentbobstrikeback. She was gracious about hearing it for the zillionth time from the zillionth man or woman who grew up idolizing her, but wickedly added 'I'm glad to know I helped you find your light saber.' And with that, she stopped being Carrie Fisher to me and just became Carrie. That's the Carrie I'll always remember: the dutiful standard-bearer of childhood dreams with a the wicked sense of humor and a way with words. She didn't want to get paid for her role in @jayandsilentbob Strike Back; instead, she asked that we buy her these antique beaver chairs. Her reason: "Beaver seems an appropriate currency for this movie." When she was a guest on Season 1 of our @hulu show #Spoilers, Carrie curled up in the throne like she belonged there. And she did: after all, she was royalty. As a boy, I dreamed of marrying Carrie Fisher. As a young filmmaker, I dreamed of casting Carrie Fisher. As an adult, I dreamed of being as sharp-witted and prepossessed as Carrie Fisher. And now that Carrie Fisher is gone, I'll dream of my friend Carrie - whose entire magnificent career I was lucky enough to witness, whose honesty made me a better person, and whose spirit - like The Force - will be with us always. Goodnight, Sweet Princess..."
We have also assembled the many tweets that were sent out following Carrie Fisher's untimely death. Naturally, these tweets represent a meager fraction of the lives Carrie Fisher has touched through her acting, writing and just being herself. Take a look at these tributes to the late, great Carrie Fisher below. R.I.P. Carrie Fisher. A brilliantly funny, talented woman. We will miss your humor now more than ever. R.I.P. Carrie Fisher. Seeing her again on talk shows was such a thrill. So hilarious & fearless when she was being herself. Carrie Fisher died bathed in moonlight, strangled by her own bra. But the Carrie Fisher I got to know through her books was more important, meant so much more to me. Just taking a moment to remember Carrie Fisher as a writer--smart, sardonic, self-aware, very funny, observant, tough but not unfair. Rest in Prace beloved, brilliant funny and eternally beautiful Carrie Fisher. We Love you. Deepest sympathy to Debbie, Joely, Tricia, Billie, Penny, Gary the dog, & all who knew and loved @carrieffisher. Rest in peace Carrie. When I was a young man, Carrie Fisher was the most beautiful creature I had ever seen. She turned out to be witty and bright as well. My heart hurts. Carrie Fisher, we interacted once for a "blink" I feel that I am all the more better for it. Rest In Peace. So so so sad. Thank you, Carrie Fisher. What a loss. Carrie Fisher had a brilliant mind. I will miss her insight her wit and her beautiful voice. Oh man. RIP Carrie Fisher. I thought you were the coolest.